Thank Jesus for His Amazing Work! In my last post I wrote about the amazing people the Lord connected us with in Cuba. How God went before us and truly prepared the way, and we were indeed surprised by our experience in Cuba. Each time we’ve gone to Cuba God has knit our hearts to the people. This trip we especially enjoyed getting to know Pastor Luis and Maiyesmi (May) Jimenez. From the moment Dawn and I met them we fell in love with them. They shared their testimony with us on the first day, and we were all in tears as they shared. We weren’t the only one’s they had this effect on as the friends that went on the trip with also were deeply touched by them. Luis & May’s Amazing Testimony! I’ve met very few people with the commitment level and sacrifice that Luis and May have made in the ministry. We were amazed as they shared about how they felt called to minister to a community 18 kilometers from where they lived. There was no church in the community they wanted to reach out to. It was not an easy place to get to. There wasn’t any public transportation to this small village, so they walked the more than 10 miles in the hot sun to get there. It took them four hours to walk that far. They didn’t have any sun block, so May got sun spots on her legs from being out in the sun so long. They went into the community and started knocking on doors. Every time someone answered the door they said they were not interested in learning more about Jesus. They knocked on every door in the whole town, and they continued to get the same response. Finally they got to the last house. The woman who answered the door said she was not interested, because she had two daughters who were confined to a wheel chair. She was mad at God. Yet the two daughters heard the conversation and they told Luis and May that they were interested in studying the Bible and learning about Christ. That’s how they began to reach that community. Dawn and I were able to take Luis and May out for a meal. What a special time for all of us! As we talked more to Luis and May we learned that they live on about $20 a month. If they or their children need a pair of shoes, or some clothing then they have to eat less that month. They live on a lot of beans and rice. While May was pregnant with their first child for about two months they had almost no income for food, so friends brought her fruit and whatever they could afford to share with them. Their son, David was born small, because of the lack of nourishment. Then Luis and May told us about all the warfare they face where they are working. They had to learn how to pray against the attacks. Part of their routine now includes regular fasting and prayer. They take prayer seriously, and they are experiencing results as the Lord works through them. Dawn and I stayed a couple of days after the Discovery Center was done and Luis and May didn’t leave until late the day after the Center ended. This gave us a wonderful opportunity to minister to one another. They told us more of their story, more of what they’ve learned and all that the Lord was doing through them. Dawn and I were able to bless and encourage them as well. I feel like it was one of the most special times I’ve ever had in ministry. I truly wish I could bottle those experiences so I had them more often. It is not easy to communicate with our friends in Cuba, because they don’t have easy or inexpensive internet service. Yet, we have been able to email one another, and encourage one another in that way. Please join us in praying for Luis and May and all of our other friends in Cuba! This week two of our good friends and colleagues, Larry and Sandy Trotter will be moving back to the United States after serving in Mexico for almost 30 years. The Trotters’ arrived in Mexico City in 1990 the year before Dawn and I landed there. They served in Mexico City for four years, and planted one church there before they moved to Guadalajara. They’ve ministered in Guadalajara, since around 1994. While in Guadalajara they’ve planted I think five churches, and started numerous mercy ministries. God has used them in a powerful way in Mexico. They will be missed! Over the last five years Larry has served as the country director for Mission to the World in Mexico. It’s sad to say good-bye to such special people. Yet if you have to go, I think they are doing it right. They are leaving behind a wonderful legacy of hundreds who have come to Christ and many more have been touched by them as they tangibly demonstrated the love of Christ. Both Larry and Sandy are very intelligent, they have many gifts and they love the Lord! Larry is a strong and wise leader. He is an excellent teacher and preacher. Sandy is caring and gentle. She is a wonderful counselor. They make a great team as a couple. The Lord has also blessed them with two beautiful daughters. Over the last few years I served on Mexico’s leadership council with Larry and I appreciated his leadership. The Lord used him to help me grow as I ministered alongside him. Last Fall the Trotters’ were able to come out together and visit us. We had a wonderful time, and we were able to show them around some. Sandy said it was the first time she had been to the West Coast. We didn’t know then it would be the last time they would visit us while they were still with MTW. One of the great things about being a missionary is you meet and serve with many outstanding people. I give thanks for Larry and Sandy and their family. They are finishing their ministry in this country well. They plan on moving to Florida where they have family. Upon arriving they will plant a church there. They still haven’t lost the fire! Larry and Sandy will leave a hole that won’t easily be filled, but we know that God is faithful and he will grow his church. The church is stronger in Mexico, especially in Guadalajara, because of their ministry of love to the people there. Lord, I pray that you guide and lead the Trotters as they leave Mexico and make this huge transition in their lives. Richly bless them as they continue to faithfully serve you. I was just at a conference for missions leaders in Scottsdale, Arizona, called Reset: Mission in a Context of Deep Change. It’s always a blessing to rub shoulders and learn from other people who are gifted and passionate about missions. 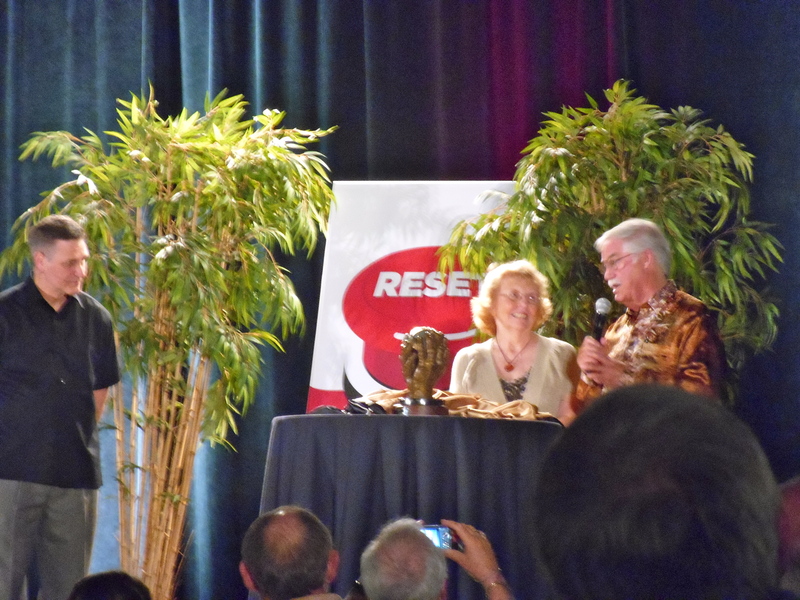 On Friday night, Greg and Sally Livingstone, were honored with the lifetime achievement award in missions. It’s a wonderful testimony to see these faithful men and women who go before us, blazing a path in missions. Greg Livingstone founded Frontiers. He founded the mission in 1983, and has helped moved missions forward as we seek to reach a people who have been resistant to the gospel. It’s sometimes overwhelming to think about all the needs around the world. Thank God, that He is a BIG God. Thank Him that missions flows out of His love the for world as stated in John 3:16, and Matthew 28:18-20, and many other passages. As I’ve mentioned in my last few posts, please pray with us for faithful workers on the border. There obviously are many other needy places around the world, and Christ has asked us to pray to the Father that He will thrust out laborers into His harvest field.